As a current USC faculty and staff member, you may download up to five copies of the latest version of Microsoft Office for use on your personal or work computing equipment, including desktop or laptop computers, and up to five copies on your iPhone, iPad, and Android and Windows mobile devices. Microsoft Office is available to faculty and staff through their USC Office 365 account. 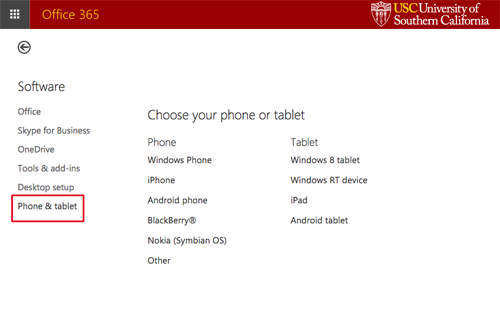 Log into the Outlook Web App (OWA), at www.usc.edu/office365. From the upper-left-hand corner of the OWA screen, click Office 365. On the upper-right-hand side of the OWA screen, click the Install Office 2016 icon. 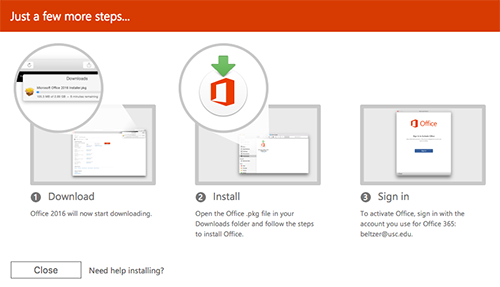 Follow the steps on the Just a few more steps… screen to install and activate your Office software. From your desktop or laptop computer, follow steps one and two in the above instructions and then click Other Installs to get to the Software page. Click Phone & Tablet in the left-hand menu. Follow the instructions that appear on the screen to complete the download process for your device. You will be redirected to a Microsoft website page where you will have the option of receiving the download link on your mobile device via email or text. Choose one of these options and complete the download process on your mobile device. NOTE: You may be directed to your device’s app store to complete the Office software download process; however, you will not be charged a fee for the download. The first time you open the software after installation, you will need to authenticate your subscription. Choose the option to Sign in to an existing Office 365 subscription (this wording may vary based on the software version you are installing). Use your USC NetID email address and password to sign in and activate your software. You may periodically be asked to enter your USC NetID email address and password to re-authenticate your desktop copy of Office. For mobile versions of Office, you will need to download and authenticate each program (Word, Excel, PowerPoint, etc.) separately using your USC NetID email address and password. If you experience difficulties logging into OWA, please verify that you are using a supported browser. For a list of supported browsers, see Microsoft’s Office 365 System Requirements/ page. For additional assistance with this service, contact the ITS Customer Support Center. If you would like more information on using Office software in conjunction with your Office 365 account, see Microsoft’s Learn Your Way Around Office 365 website. NOTE: USC’s licensing agreement provides this software only to current faculty and staff. Once you are no longer a current USC faculty or staff member, you will lose access to any software that you have downloaded. Available software currently includes Word, Excel, PowerPoint, Outlook, and OneNote. Microsoft determines which versions of the software are available for download; available software may vary based on your operating system.